Lawmakers rolled back Gov. Sam Brownback’s signature tax policy over his objections Tuesday night, forcing into law tax increases to fix a budget shortfall and provide more money for schools. The legislation ends the “march to zero” income tax cuts that Brownback heralded for much of his time as governor. The experiment has been going on for years, since at least 2013, but we have not yet seen the promised “shot of adrenaline” effect that was promised. Figure 1: Log GDP relative to 2011Q1 for US (black), Plains (teal), and Kansas (red). NBER defined recession dates shaded gray. Source: BEA, and author’s calculations. the legislature eliminated a cut Brownback had put in place to help small businesses. Analysts said that the provision had become a loophole, as many Kansans were able to avoid paying taxes entirely by pretending to be small businesses. Just to be clear, this provision is something the President has indicated that he wants to include in his tax reform plan. What’s the likely macro impact in Kansas? Without knowing too much about how the additional tax revenue will be directed to spending, it’s hard to say, so what follows is necessarily a back-of-the-envelope calculation. Reecalling the balanced budget requirements, it seems that spending would be about $600 bn million per year higher than what it otherwise would have been. Tax revenues rise, which depresses aggregate demand, while government spending and transfers rise, which elevates aggregate demand. Assuming transfers are spent with a marginal propensity to consume of unity, then the elevated spending of about 530 billion million Ch.2009$ (the GDP deflator is 13% higher in 2017Q1 than in 2009) results in a real GDP about 0.4% higher than it otherwise would have been (to be specific, I’m assuming a balanced budget multiplier, and presuming there is some slack in the state economy). This does not mean the economy will necessarily rebound strongly; however, in reducing the likelihood of yet more austerity, it should be helpful to growth. At the very least, it will signal the return of some sanity in the conduct of Kansas fiscal policy formulation. This entry was posted on June 7, 2017 by Menzie Chinn. It’s nonsense tax-cut policies like this – often positively spun as “reform” – that keep poisoning the public’s opinion on real tax reform, which the country really needs. Lazy, 1 page, double-spaced “plans” aren’t helping, either. In the next-to-last paragraph, that starts “What’s the likely macro impact in Kansas?”, shouldn’t those figures be in millions of dollars, not billions? Michael Cain: Yes, absolutely you are right. Fixed now. Thanks! It was billed by Brownback as the best plan for growth in the country. Look out Texas, here we come? Uh, no. A look at Kansas population growth tells an interesting story . From 2007 through 2011–pre Brownback–, Kansas population grew by 19.8% (www.ipsr.ku.edu), or approximately 106,000. Yet, when the revolution came with promises of economic nirvana soon to follow, more people did not. The Brownback years have seen a population increase of just 7.9%, or 22,000 more Kansans. The Kansas labor force has remained static as well and is actually less than its peak in the pre Brownback era. You’re not going to get “economic nirvana” losing high-paying jobs in fossil fuels, agriculture, and manufacturing caused by market forces, not government. Of course, fewer high-paying jobs in government was mostly caused by government. I suspect, illegal immigration slowed over the U.S. “recovery,” particularly in agriculture states. Lower taxes can raise living standards, since there’s less money directed into wasteful government spending and workers have more money for consumption, although retail jobs don’t pay much. Kansas needs a few Microsoft-type firms to move in. However, who wants to move to the middle of nowhere? Krugman showed people move to where there are other people, causing metropolises to become megatropolises, and people like states with scenery, e.g. beaches or mountains or at least a Disneyland. Moreover, Kansas population is older now. Brownback did not direct his tax changes solely at Kansans. They were directed at those outside the state who supposedly would flock to Kansas to take advantage of, in Brownback’s words, “the best growth plan in the country.” That it was not has now been acknowledged by no less than members of the Kansas legislature, both Republican and Democrat whose own constituents have also spoken. When the legislation was passed, Brownback’s secretary of revenue chimed in with his own hyperbole, including adding 22,000 new jobs OVER AND BEYOND those added by normal growth. Apparently, wide scale blowharding was not limited to the governor’s office since even normal growth has been a non-starter as numerous posts by this blog’s author have shown. If Kansas suffers from being in the middle of nowhere, as you state, tax reduction schemes that make non payers of those with higher incomes a focal point while those with lesser incomes share more of the burden, it won’t get out of the middle of anywhere any time soon. Of course, it could cut the income tax rate to zero for everybody while raising other taxes significantly to do so. That might induce more immigration. Or–depending on the state’s willingness to fund public services– put Kansas well on the road to becoming an American Somalia. the new republican platform for kansas is to move google and facebook to topeka and restore economic growth! peak, you have come up with a bunch of pathetic excuses for the poor performance of kansas. you are ignoring the major issue. economic policy ineptitude brought on by false idolatry of the tax cut gods. It’s easy for some states to attract rich and highly educated people from other states and foreign countries, as Krugman predicts. It’s not that easy for a state like Kansas, which spends a lot per student and doesn’t benefit when there’s a brain drain to other states. It’s not pathetic workers keeping more of their hard earned money instead of government wasting much of it. I know, big government is your true idol. It’s pathetic when the cost of government is shifted to middle and lower class workers because those with more income pay little or no state income tax. And I know your love of greed and self trumps (pun intended) all else. Noneconomist, obviously, you know nothing about me. And, I’ve shown data federal income taxes are very progressive. peak, that report is from 2012. do you have anything from today’s vintage? It looks like Wichita has a lower unemployment rate than Kansas City. You’re the one showing ineptitude. PeakTrader There was a time when Lawrence, KS had the highest per capita education level in the country. Yes, it’s true. But that was then and this is now. If you want to attract the kinds of bright minds that are likely to establish high tech corridor investment, then cutting education probably isn’t the smart play. But the predicate for all of that kind of business is good education and infrastructure, both of which tend to be public goods requiring tax dollars. If you aren’t willing to spend money on those kinds of investments and instead cut taxes for the unproductive rich rentier class, then you’ll end up with what Brownback delivered…hell on earth. I think, Kansas has progressive taxes, along with spending on education and infrastructure. Detroit was also a wealthy city at one time. The suburbs around the north side of Detroit are still quite wealthy. Detroit is a “special case” unrelated to tax policies. However, even generalizations such as 2Slug’s have exceptions. “Median income” is directional, but detailed data is informative. education is not wasteful spending. it is an investment in the future. kansas did not provide that investment under brownback. you seem unwilling to confront this reality. peak, if kansas is such a prosperous economy, why don’t you move there? Why do we spend so much on education and get poor outcomes? I can think of many places I’d rather go than Kansas. Menzie Chinn, I posted that comment in Las Vegas. kansas is not full of college students who got poor outcomes. kansas is full of college students whose state leadership has not provided any economic opportunities. kansas produces good college students-they have good universities. but they leave the state. why? because of economic policies such as brownback (and others) through the years. 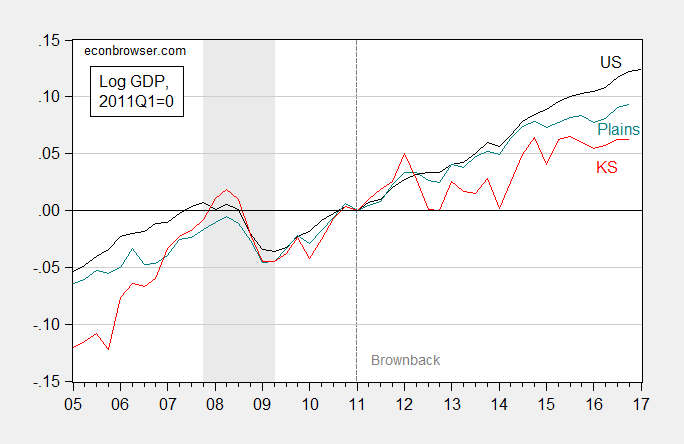 brownback economics should have produced good opportunities-but they did not. they failed. That’s the argument Laffer puts out when arguing for the supply side economic theory and you are espousing that. The reality is that it always blows a hole in the budget and that leads to less spending in education, road maintenance and a host of other programs that is geared towards the quality of life. Guess what they have to do to offset that: imposed higher sales taxes or raid money from other accounts to balance the budget- money used to pay for certain programs only and its fund balance. And Kansas did exactly what I l outlined in the previous sentence. Kansas raised its sales tax twice and that didn’t even do the job and its fund balance has been depleting for quite some time. Kansas was staring at $350M hole when the Legislature overrode Brownback’s veto which they added a third bracket to tax higher income. Credit rating agencies frown on states not managing its budget like that including the fund balance and will hit the state in the pocketbook in form of higher rate when they want to borrow to pay for things. Au contraire. Brownback got exactly the results he wanted. Starving the Beast is a thankless job. Only partially. Adoration from true believers, but a 27% approval rating and very little of the expected cheering and genuflection from the vast majority of Kansas. Blowharding has serious limitations, especially when the blowhard is a governor whose ideology becomes more important than the concerns of his citizens.